When Life Gives You Friends sometimes you need a second helping! Everyone needs a fresh start once in a while! Recipes using items from your garden such as black bean salad and zucchini bread! When you are trying to decide on that perfect dish to take to a pot-luck or book club, reach for this recipe book! Sharing tasty treats with your neighbors is easy now that we have this collection of sweets to make and share. 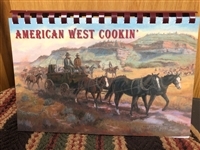 Red, Yellow or White Decorative Chalkboard 7.5" x 6.5"
Cowboy style meals with a variety of meats and add ins, plus dessert! Ceramic, Food Safe 3.5" x 3.5"